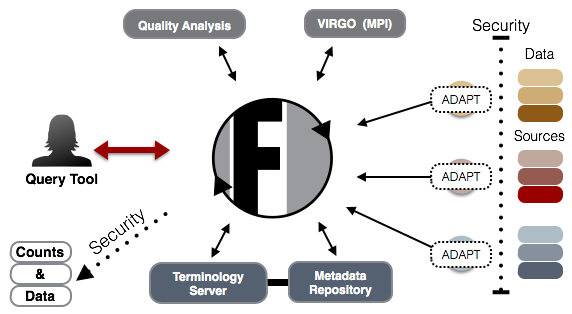 OpenFurther is a next generation federation architecture. It's built from the ground up to connect disparate data resources with a scalable federated query engine. OpenFurther technology translates heterogenous data models on the fly, empowering researchers to gain new knowledge and speeds up the delivery of data from months to minutes. OpenFurther supported by the NCRR/ NCATS Grants UL1RR025764 and 3UL1RR025764-02S2, National Center for Clinical and Translational Science 1UL1TR001067, along with the University of Utah Research Foundation, infrastructure resources from Center for High Performance Computing, and grant 1D1BRH20425 (DHHS). PHIS+ funded by grant R01 HS019862 from AHRQ, (DHHS). VIRGO (MPI) supported by NLM Grant 5RC2LM010798. REDCap is supported by Center for Clinical and Translational Sciences grant support 8UL1TR000105. Copyright © 2008-2014 OpenFurther. All rights reserved.